Incidence, predictors, and outcomes of aortic regurgitation after transcatheter aortic valve replacement: meta-analysis and systematic review of literature. October 27-30, 2013, Fairmont Copley Plaza, Boston, USA. John V. Frangioni, M.D., Ph.D.: Professor of Medicine and Professor of Radiology; Director, Center for Molecular Imaging, Beth Israel Deaconess Medical Center, Boston, MA. Program Committee: Jason S. Lewis, Ph.D. & Anna M. Wu, Ph.D. Organizing Committee: James P. Basilion, Ph.D. & Zaver M. Bhujwalla, Ph.D. 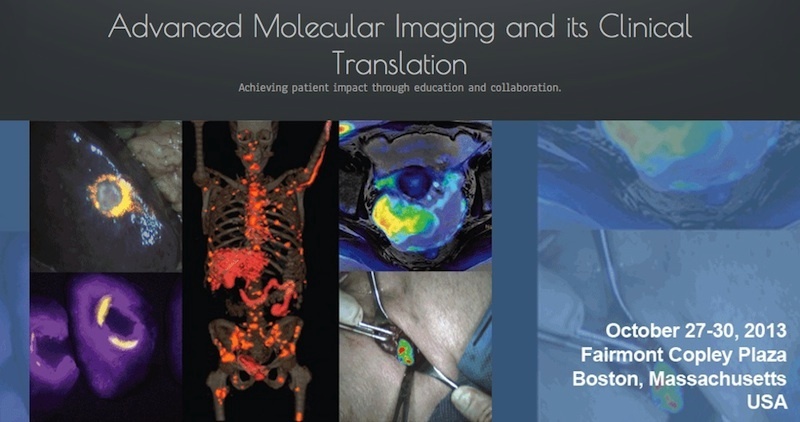 The course will cover most aspects of molecular imaging including optical imaging, SPECT, PET, CT, MRI, ultrasound, combinations thereof, contrast agent chemistry, radiotracer development, preclinical imaging, regulatory, statistical, reimbursement, and logistical issues surrounding clinical translation, and state-of-the-art clinical imaging in cancer, heart disease, neurology, and other human conditions. Physicians, scientists, and trainees will be updated on the latest techniques in molecular imaging as well as those under development and slated for clinical implementation in the future. Faculty will also offer a glimpse into emerging methodologies in molecular imaging that could become part of clinical practice within the next decade. Based on feedback from the initial course in October, 2012, lectures have been shortened to permit more time for questions and answers, and industry has been engaged to address the present conundrum that most new technology in molecular imaging never becomes available for patient care. The course is sponsored by the World Molecular Imaging Society (WMIS) and the Department of Medicine at Beth Israel Deaconess Medical Center (BIDMC) / Harvard Medical School and the non-profit FLARE Foundation, Inc.
Napkin-Ring Sign on Coronary CT Angiography for the Prediction of Acute Coronary Syndrome. Factors associated with compliance to lipid-lowering treatment in China. Xie G, Zaman MJ, Myint PK, Liang L, Zhao L, Wu Y. Eur J Prev Cardiol. 2013 Apr;20(2):229-37. Factors associated with compliance to lipid-lowering treatment in China. Xie G, Zaman MJ, Myint PK, Liang L, Zhao L, Wu Y.
Eur J Prev Cardiol. 2013 Apr;20(2):229-37. Association of epicardial fat with cardiovascular risk factors and incident myocardial infarction in the general population: the heinz nixdorf recall study.